Thinking about increasing the fun at your home this summer with some brand new outdoor recreational equipment? Make sure that your home insurance in Fall River covers anything that you add and make adjustments for things that aren’t covered. 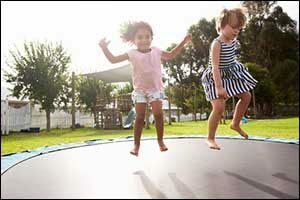 Your insurance agent in Fall River can answer any questions that you might have about summer fun equipment, like a brand new pool, spa, trampoline, built-in BBQ, fire pit, or even a basketball court. Make sure that you are covered with comprehensive homeowners insurance so all you’ll have to think about this summer is having a great time in your own backyard. Who wouldn’t want to spend lazy summer evenings out by a fire pit roasting marshmallows with the kids or enjoying a quiet evening with a loved one? Fire pits are by far one of the most appealing backyard landscaping and hardscaping projects in America today. Lots of people have them and those who don’t, most likely want one. But are they covered under your Fall River homeowners insurance policy? The best way to find out is to speak with your agent. You can tell them what you want to do and they will ask questions about the type of installation, the location of the fire pit or other backyard add-on, and they can then provide you with answers. At the very least you might want to increase your homeowners insurance coverage limits. A built-in fire pit will increase the value of your home, so you will want to make sure that it is included in the coverage limits for claims if you need to replace it during a covered event. Ask your insurance agent in Fall River if you have enough coverage in case a guest gets injured by your fire pit or anything else while at your home. You will also know how much coverage you have in case damage to someone else’s property occurs, such as a fire spark igniting on your neighbor’s backyard shed. The same is true for trampolines, built-in BBQ kitchens, swimming pools, and everything else. Will you be covered if something goes wrong? That is the whole point of home insurance in Fall River. When it comes to speaking with your agent about additions that you make to your backyard, there are a few things that you should most definitely discuss. The reason why these items made the list is because of the inherent risk that they could potentially pose to you, your guests, and other property. That’s not to say that these items are so dangerous that you shouldn’t even think about getting them, but that Fall River homeowners should think twice, carefully consider their options, and speak with a reputable agent. You don’t want to accidentally add something that doesn’t seem to have any potential risk, such as a front yard basketball half-court, only to find that you won’t be covered if something happens while you or your guests are using it. Before you make a major investment in anything new for your home that could be a potential risk to your homeowners insurance coverage, just make a quick phone call to your insurance agent in Fall River. You may be surprised to discover that you are covered or that you can add coverage that would provide for the added risk to your Fall River homeowners policy. You will also want to learn about any terms and conditions that should be met for safer installation or use, as well as any state-specific regulations or exceptions that might impact your coverage. If you need a free quote for homeowners insurance or if you would like to make adjustments to your existing Fall River homeowners policy, give us a call at 508-678-9611. Our team can answer any questions that you might have about home insurance in Fall River and the surrounding Southeastern Massachusetts area. We can also help you to make informed decisions about changes, upgrades, and additions to your home to ensure that you are properly covered and protected.